Thirsty Pilgrim: DC's Brickskeller Gets a Chance to Improve? The news is out today that the Brickskeller pub's current location in D.C. is set to close on December 18 or so. Yes, it's a classic. It's an institution. It was once one of the country's top beer bars. Beery types from coast to coast--including me--have fond, sepia-colored memories of visiting the place and perusing the absurdly long bottle menu. Now I'll say what most local beer lovers already know: The place has been coasting on reputation. That menu has been a work of historical fiction for quite a while now. For years, the Brickskeller has almost never had what anyone wanted to order. (Not unless you count scoring a hit on your third or fourth try.) I'll pardon the food, since that was never really the point of the place, although the cheese board was usually safe. Meanwhile service ranged from friendly and smart to embarrassing. Why do I say such mean things? Because they're true, and I like to tell the truth. Remember it next time I post a rave review of some café or brewery. To be fair: The Brickskeller--which also offers lodging--is not necessarily closing for lack of business. Another boutique hotel is buying up the place, a valuable piece of real estate thanks to its location. Jay Brooks says owner Dave Alexander may well open a new Brickskeller elsewhere. I smell an opportunity. Since the novelty of über-long beer lists is wearing off these days--well, we still love them, it's just that they're a dime a dozen now--let's hope any new Brickskeller sticks to quality and truth-in-advertising. More like its popular sister pub, RFD. 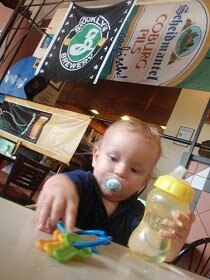 Pictured: My son chilling at RFD with his beverage of choice back in July. No worries, I wasn't driving. Note who has the keys.